A decade has passed since Paul Crutzen published his editorial essay on the potential for stratospheric geoengineering to cool the climate in the Anthropocene. He synthesized the effects of the 1991 Pinatubo eruption on the planet's radiative budget and used this large-scale event to broaden and deepen the debate on the challenges and opportunities of large-scale geoengineering. Pinatubo had pronounced effects, both in the short and longer term (months to years), on the ocean, land, and the atmosphere. This rich set of data on how a large-scale natural event influences many regional and global facets of the Earth System provides a comprehensive viewpoint to assess the wider ramifications of geoengineering. Here, I use the Pinatubo archives to develop a range of geopolitically relevant ranking criteria for a suite of different geoengineering approaches. The criteria focus on the spatial scales needed for geoengineering and whether large-scale dispersal is a necessary requirement for a technique to deliver significant cooling or carbon dioxide reductions. These categories in turn inform whether geoengineering approaches are amenable to participation (the "democracy of geoengineering") and whether they will lead to transboundary issues that could precipitate geopolitical conflicts. 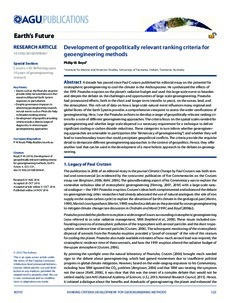 The criteria provide the requisite detail to demarcate different geoengineering approaches in the context of geopolitics. Hence, they offer another tool that can be used in the development of a more holistic approach to the debate on geoengineering.